Elaine has spent her sixteen years proving that she's nothing like her murderous father--but no one will let her forget her dark family history. So when her best friend Talia is missing, Elaine takes the search and rescue into her own hands. But on her quest, Elaine crosses through a portal and into a vast, pristine wilderness. She finds herself in an alien world filled with strange wildlife, sprawling forests, deep caves and immense danger. And Elaine's the only person in it. Her phone has no bars. There's no Facebook. 911 is useless. As if that's not bad enough, she failed summer camp. And there are the creatures underground, ready to come out and hunt as soon as night falls. In order to survive and rescue her friend from them, Elaine may have to embrace her dark family history after all. 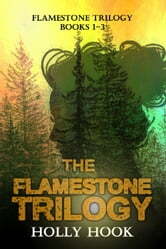 The story continues in Found (#2 Flamestone Trilogy) and concludes with Freed (#3 Flamestone Trilogy.) A companion novel, Light, is also available outside of this set.